Comments: Something about this book just didn't quite work for me. There are some interesting ideas and images here, but there was just too much--too bad Tim Gunn wasn't there to tell her to bring her editing eye to this project. In the video below, the author describes intending the book to have a fairy-tale quality to it so maybe that explains the excess. Thanks so much to all who entered my first ever giveaway. This was fun--I think I'll have to do more of these, maybe as a way to weed out some of my books. Debbie at My Mind on Books has won the free copy of Linchpin by Seth Godin! Congratulations Debbie. I'll get it in the mail to you asap. You have until 10 p.m. today to enter the Linchpin giveaway. Just go to this post and leave a comment. The winner will be chosen randomly and will be announced tomorrow. Good luck! Judging for the 2010 AAUP Book, Jacket, and Journal Show took place January 28-29 at the AAUP Central Office in New York City. Approximately 281 books, 286 jacket and cover design entries, and 8 journals were entered. From this pool of excellent design, the jurors chose 56 books, 1 journal, and 40 jackets/covers as the very best examples. Don't forget to leave a comment on this post to enter the giveaway for Seth Godin's Linchpin. You have until 10 p.m. central time tomorrow (Wednesday, Feb. 24). Don't forget to leave a comment on this post to enter the giveaway for Seth Godin's Linchpin. I do most of my reading before bed. It helps me to stop thinking about things I should have done today or need to do tomorrow. Linchpin makes me think too much about not only what I should do tomorrow, but whether I’m thinking about the things I should be thinking about. In other words, not good bedtime reading. However, it is good enough that I'm willing to carry it around with me so I can read it during the day (I rarely do this with books any more--I usually have an ebook or two on hand for daytime reading). How perfectly Seth Godin that he sent a 2nd copy for free as an unexpected gift, trusting his audience to know how to market and distribute his book. So, I now have an extra copy of Linchpin that I’d like to give away. If you’d like a chance to win it, just leave a comment (make sure you leave an email address so I can notify you if you win). A Novel Idea Bookstore is currently having Cinnamon's "annual" 29th birthday party where all books are 29% off. It started yesterday and runs through Sunday, Feb. 22. Indigo Bridge Books is having their annual sale next weekend: Saturday, February 27th 8 am-10 pm, & Sunday, February 28th, 12-8 pm. 35% off select books! Lifehacker has a poll up asking How Much Would You Pay for an E-Book? I chose the answer, "Like dead-tree books, it completely depends on the book." Sure, I like paying less for books, but I'm not stuck on the $9.99 price. The way I think about it is if it's a book that I would be willing to pay hardback prices for in print, I'm willing to pay more for the e-book. If it's something I'd read as mass market in print, I want to pay less. Other things that matter to me are quality (I hate to see a badly formatted e-book, no matter what I paid for it) and I'd love to be able to lend e-books. The availability thing really annoys me, though. Here's what happens if a book that I want as a e-book isn't available in that format: I find one that is. And who knows if I will remember to check again later to see if that book is now available? There are a lot of books out there, and I want most of them. So you're going to make it harder for me to get yours? Fine. There are plenty of others. somewhere, somehow, on your site (and within the books, whether print or e-) make it so that I can see the books in a series listed in order (and make it clear that they are listed in order). make all of the titles in the series available in the same formats. And when moving to a new format (such as e-book), consider starting with the first one. I guess I could see why you'd want to publicize the new format for the latest one, but when you do it would be great if the previous titles were also available. What do you think? Is it $9.99 or nothing for you? Any book-buying (e-book or print) pet peeves you'd care to share? Usually, I don't get the TV my mom chooses to watch. When I was in Ohio one time minus the last time, we saw an episode of Gray's Anatomy in which all plot lines were sad and everyone was dying or failing at their job, and I kid you not, I believe every single character cried at one point or another. The whole thing was just so very, very depressing that at the end of the episode, I was moved to yell, though tears, "Why do you watch this?" at my also-crying mother. NOT the ideal TV experience for me. So, when I was home this past Christmas and my mom and dad seemed excited about the "Jesse Stone" show that was coming on TV, I was very, very dubious. In CBS's Jesse Stone series, Tom Selleck plays Jesse Stone; the episode I saw was called Thin Ice. I expected it to be awful, but instead I loved it, and I'm grateful to my mom and dad for pointing it out to me. Tom Selleck plays Stone in the series, and he's really perfect, I think. Once in a while--though hardly ever--a fictional detective is cast perfectly in a TV series. The last really great (and probably unparalleled) example of this would be the inimitable Jeremy Brett in the BBC's Sherlock Holmes series. 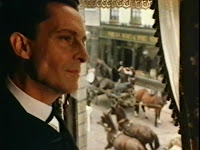 Jeremy Brett was Sherlock Holmes. Now, I can't make the same claim for Selleck/Stone because at this point I've only read a few of the Stone mysteries (and still have seen only one of the TV shows), but I feel that Selleck really nails the essence of Stone (in my opinion): he's great at the restrained delivery required to make Stone's deadpan brand of humor come off successfully on screen. He also does a fabulous job of communicating Stone's world-weary, thoughtful approach to police work. The other main roles are cast very nicely, too: I liked the guy who plays Suitcase a lot, and Kathy Barker, who plays Molly, is wonderful also (though I believe we are to think she is younger in the books, I actually prefer her to the book version). At any rate, the TV show was quite a surpise, in the best of ways. Since I'd liked the TV show so much, I started listening to the audiobooks, and I think those are also well worth the time. It's a rare gift to me to find a great detective series I hadn't known about before, and this series has many of the components I love most: a complicated, introspective, flawed but likable detective; intelligence and humor in the dialogue and the story, but also a respect for the horror of crime/homicide; strong supporting characters; crimes that are resonant and upsetting. In addition, Stone is in therapy, and I enjoy how Parker portrays his therapist, Dix. It's an excellent example of how even a macho guy can be thoughtful about his emotions and moral behavior. The audiobooks are read by Scott Sowers, and he does (to my Ohio/Nebraska ears) a fine job with the New England area accent of the locals (Suitcase and Molly in particular). 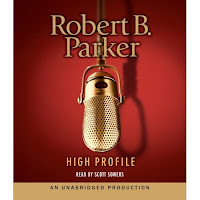 The audiobooks are really addictive; thus far, I've listened to High Profile, Night and Day, and Sea Change. All of these audiobooks are available for download from the Lincoln City Library's downloadable audiobooks page. It has revolutionized my life, that service. I have yet to actually read a Stone mystery from a physical book. That's my next goal. I was quite saddened, like Jana, to see that Robert B. Parker recently died, particularly (for selfish reasons) since I just discovered him and was hoping for many more Stone mysteries. I will have to try the Spenser books, perhaps. If there is one thing that rankles a bit in the Stone books, it has to be the portrayal of him as devastatingly attractive to most (if not all) women, and also, his addiction to a bad, bad relationship with Jen, who is an interesting if fairly irredeemable character. Women like Jen--beautiful liars who sleep their way to the top--don't really exist, I always thought; they are mostly a sexist stereotype. Now, I could be wrong, but I hope I'm not. But like I said, Jen is at least marginally interesting, though Stone's blind devotion to her is puzzling. (He is working it out in therapy, of course!) Finally, there is a healthy level of on-the-job sexual innuendo at the Paradise Police Dept., and while mostly that makes me smile, sometimes I feel sorry for Molly, the lone female in the department. If you are reading fairly hard-boiled detective novels, you're going to encounter stereotypical portrayals of women; that is a given. The great writers end up making these women compelling characters nonetheless, and my early impression of the Stone books is that Parker manages to do so successfully. Here. Amazon wants its publishers to continue to offer all new e-books for $9.99. Macmillan decided it needed to charge more, from 12.99 to 14.99. Initially, Amazon took Macmillan titles off its site and stated that it would stay the course and not raise its prices--but ultimately, Amazon capitulated. But would I pay more to get a new e-book title on time? I don't want to. It depends on the book. Maybe. If I have to, I guess I will, but it makes me angry. It's frustrating as a user to see a good deal slipping away, whether or not it's a good thing for publishing as a whole. Finally, in preparation for the future, I am trying to fight instinctive revulsion response to the name "iPad," but the struggle is a hard one. How do you decide which sites you link to? A recent tweet from @booktweeting inspired some thoughts about how I choose which online selling sites I link to on this blog. But first, I'm curious about how you decide. Is it based on brick & mortar stores you like? Do you always choose indies? Do you prefer going directly to the publisher? Do you make your decision based on how you feel about the website itself? 1. Google the title and look at various sites to find a cover image I can use -- I want the front cover only, cropped (no white space around it), at a decent size/resolution. This is where Amazon loses me right off the bat -- their cover images always seem to have extra junk on them (white space, "Look Inside!" logo, etc.). I also stumble across all sorts of interesting content, such as other reviews, related articles in the media, etc., through simple searches. Powell's: I've always been a fan of indies and they're the king. non-Amazon chains such as B&N: Not Amazon for reason #1 and also because their site has become such a mess over the years. B&N also often has neat additional content (like the B&N Studio). However, they sometimes shoot themselves in the foot by making it hard to use (sometimes can't be embedded or isn't easy to find). 3. Another factor for me is the website itself. As I mentioned, it's another reason I rarely link to Amazon -- I just don't like the jumbled mess that their site has turned into. But if, for example, I start noodling around on a publisher's site and find it difficult to navigate I might not link to it even if they had a good cover image. Well, that's it in a nutshell. What about you?